Comments: Glaucous Gulls are large, pink-legged, white-winged, white-bodied birds. They are aggressive scavengers. They have a circumpolar breeding range and nest on open tundra and coastal cliffs. They feed on fish, young birds, crustaceans and carrion. Glaucous Gulls are more commonly reported than Iceland Gulls but may be confused with them. 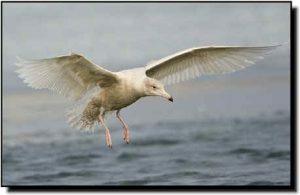 Glaucous Gulls occur in small numbers or are found only in localized sites within the Great Plains.